Isaiah is equally insistent: “Therefore thus says the Holy One of Israel: because you reject this word, and trust in oppression and deceit, and rely on them; therefore this iniquity shall become for you like a break in a high wall, bulging out, and about to collapse; its crash comes suddenly, in an instant; its breaking is like that of a potter’s vessel that is smashed so ruthlessly that among its fragments not a sherd is found for taking fire from the hearth, or dipping up water out of the cistern” (30:12-14). And, voicing the deepest convictions of God’s People, the Prophet cries out: “We have all become like one who is unclean, and all our righteous deeds are like a filthy cloth. We fade like a leaf, and our iniquities, like the wind, take us away” (64:6). The Prophets likewise denounce the hardness of heart that leads to appalling blindness and prevents us from perceiving the gravity of sin. Let us listen again to Jeremiah: “For from the least to the greatest of them, every one is greedy for unjust gain; and from prophet to priest, every one deals falsely. They have treated the wound of my people carelessly, saying ‘Peace, peace’, when there is no peace. They acted shamelessly, they committed abomination, yet they were not ashamed, they did not know how to blush” (6:13-15). Jesus entered into this history ravaged by sin, and took upon himself the burden and brutality of our sins. When we look upon Jesus, we see clearly the destructive power of sin and the sickness of our human family. Our own sickness! Yours and mine! Yet – and this is the second certainty – Jesus countered our pride with humility; he countered our violence with gentleness; he countered our hatred with the Love that forgives. The Cross is the event which enables God’s Love to enter into our history, to draw close to each of us, to become a source of healing and salvation. Let us never forget: from the beginning of his ministry Jesus had spoken of “his hour” (Jn 2:4), of the hour “for which he had come” (Jn 12:27). It was an hour which he joyfully welcomed, when, at the beginning of his Passion, he cried out: “The hour has come!” (Jn 17:1). 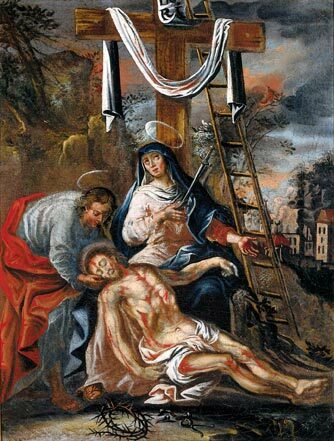 The Church treasures this memory, and in the Creed, after professing that the Son of God “became incarnate from the Virgin Mary and was made man”, she goes on to say: “For our sake he was crucified under Pontius Pilate; he suffered death and was buried”. For our sake he was crucified! Jesus, at his death, embraced the tragic experience of death as it had been fashioned by our sins; yet, in his death, Jesus filled death itself with Love, he filled it with the presence of God. By Christ’s death, death itself was vanquished, for he filled death with the one power capable of cancelling the sin that had spawned it: Jesus filled death with Love! Through faith and Baptism, we have access to the death of Christ, to the mystery of the Love by which Christ himself tasted and conquered death ... and this in turn becomes the first step of our journey back to God, a journey which will end at the moment of our own death, a death experienced in Christ and with Christ: in Love! As you begin this “Way of the Cross”, let Mary take you by the hand. Ask her for just a bit of her humility and docility, so that the Love of Christ Crucified will be able to enter your heart and recreate it after God’s own Heart. and the pure of heart roundly mocked. and the pure of heart shine like stars in the night. knowing that it is also our way. the joy which no one can ever take from us! that is why you want to save me! come to me with your boundless love! come to me with your meekness and humility! I am the prodigal son needing to return! peace with you, and in you, joy.